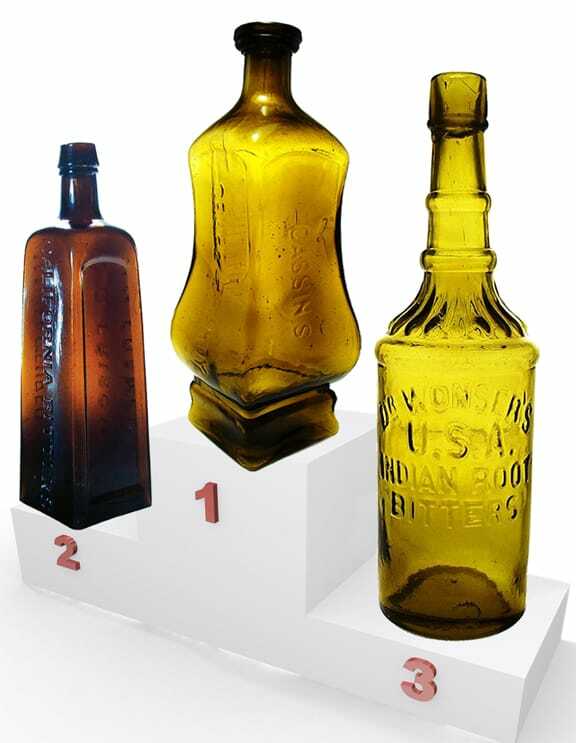 The western Bitters collectors, which is a strong, passionate group, have reactivated their desire to determine the TOP 20 WESTERN BITTERS. This task was done some years ago apparently. 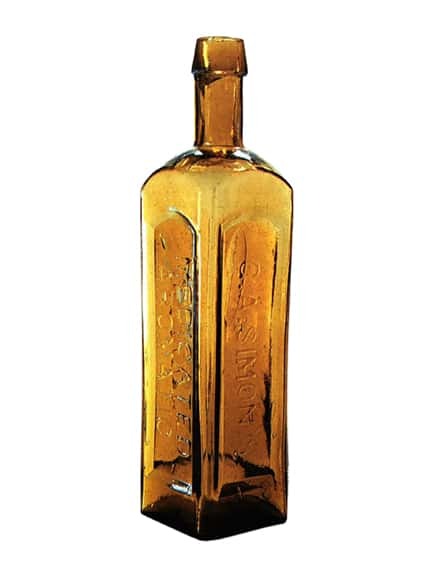 What is a western Bitters? 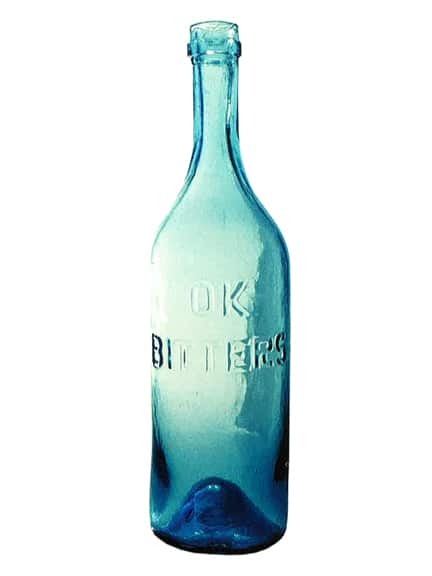 Are we talking about a specific Bitters brand? 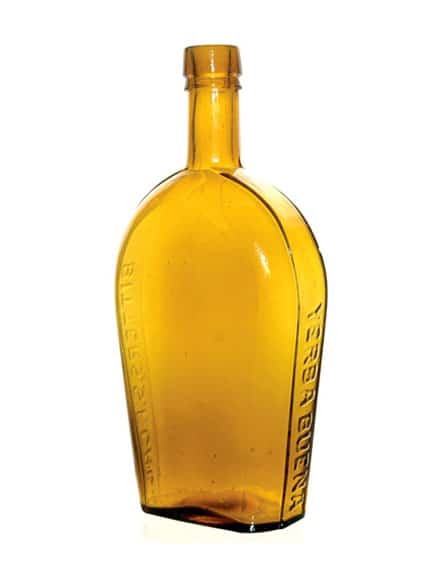 Should the word Bitters be on the bottle? on the label? 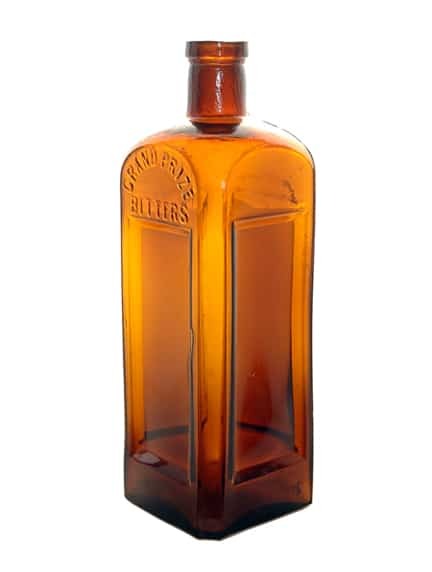 Are we talking about Bitters molds too? Extra points if the bottle has California, San Francisco etc embossed on bottle? I suppose, in the end, this all has to weigh in when you cast your vote. 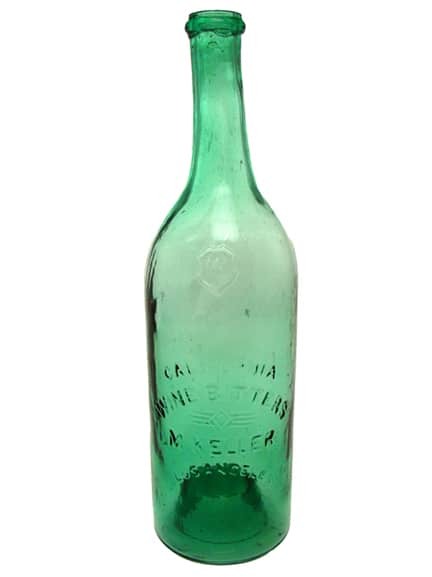 Without a doubt, the major qualification should be that ‘the bottle was made at a Western (California) glass works’ such as Pacific Glass Works or San Francisco Glass Works. 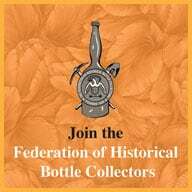 Here is the post (see below) from Dale Mlasko from Oregon, that got me involved as I hold many nice western Bitters myself. 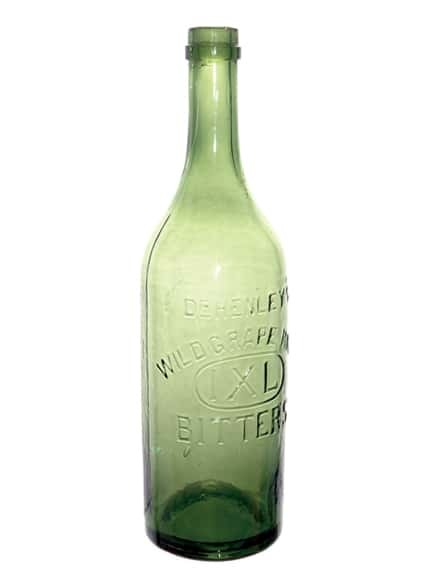 I tried not to post mostly green bottles. 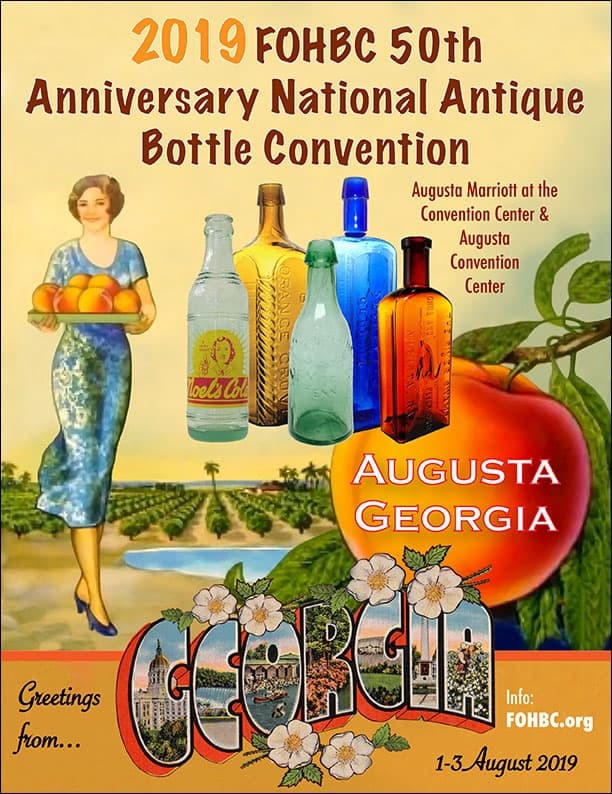 The bottles are anonymous though many of us can determine the owners. 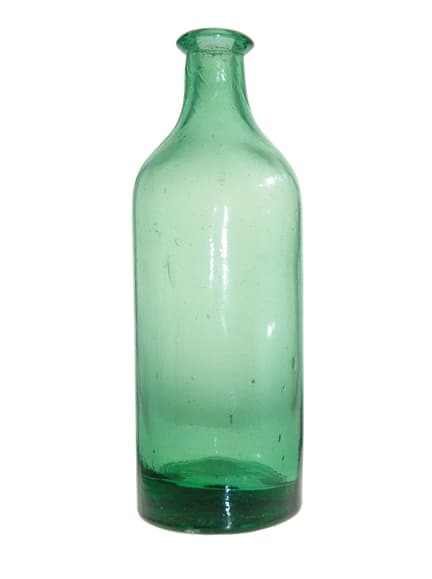 I thought about making all bottle pictures black and white but that was painfully difficult to do. 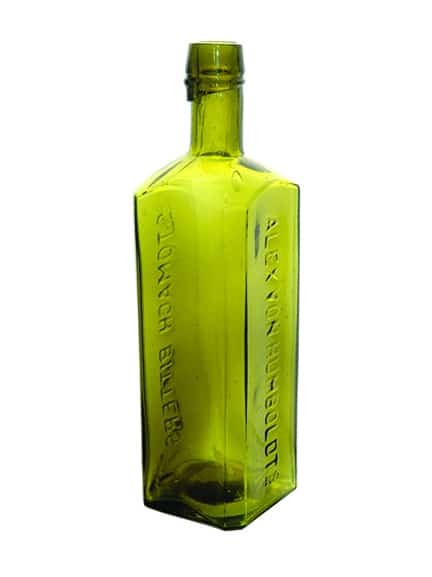 I also am asking for better pictures if they are available and looking for a Dr. Hauseman’s German Bitters (flask) picture or actual bottle! Please send me an email of your top 20 for RANKING compilation or post on this site or Western Bitters News. 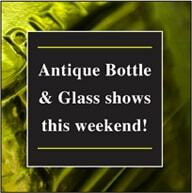 I suggest we announce at the FOHBC 2012 Reno EXPO. AT & Co (embossed monogram in oval on shoulder), Very interesting neck design. 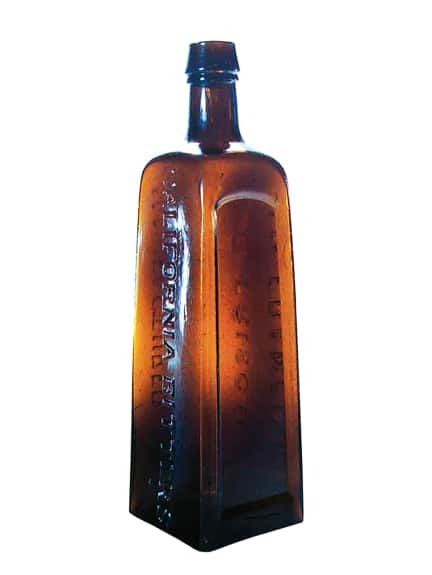 BITTERS not embossed on bottle. Assumed Bitters product. Colors range from amber to olive amber and yellows. Exciting color runs possible. AT stands for Asher S. Taylor. 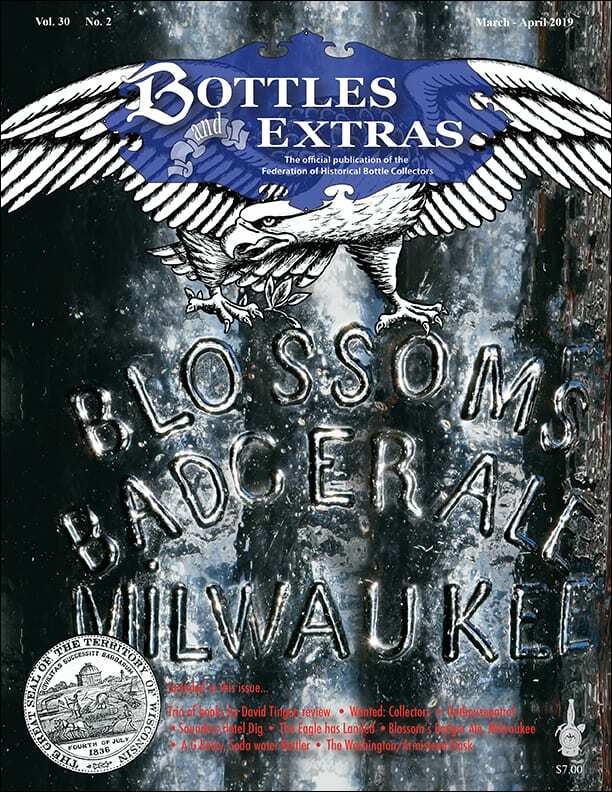 Not listed in Carlyn Ring and W.C Ham’s Bitters Bottles or Bitters Bottles Supplement. AFRICAN STOMACH BITTERS, R/H numbers A15, A16 and A18. Also embossed SPRUANCE STANLEY & CO on A16 and A18. A San Francisco product. 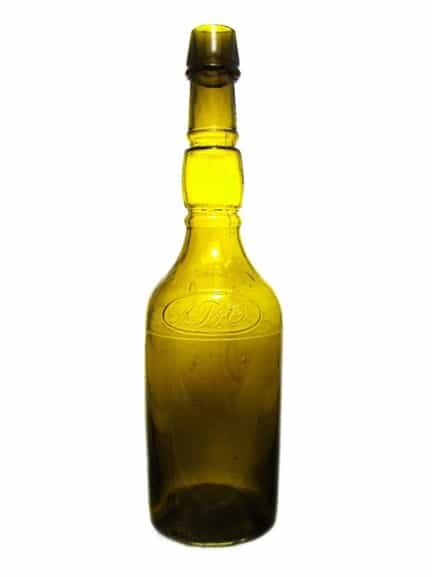 Round, amber bottle. Look for crude examples with applied top. 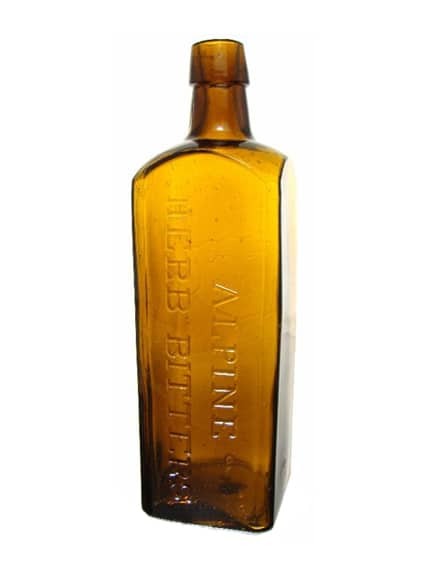 ALPINE HERB BITTERS (motif shield with monogram TT&CO), R/H A37. 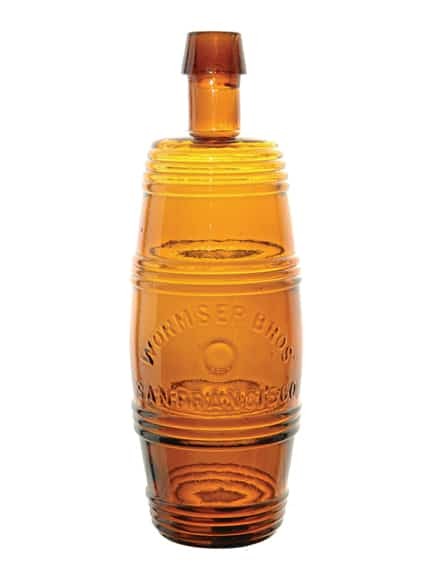 Square, amber bottle. Look for examples with an applied top. 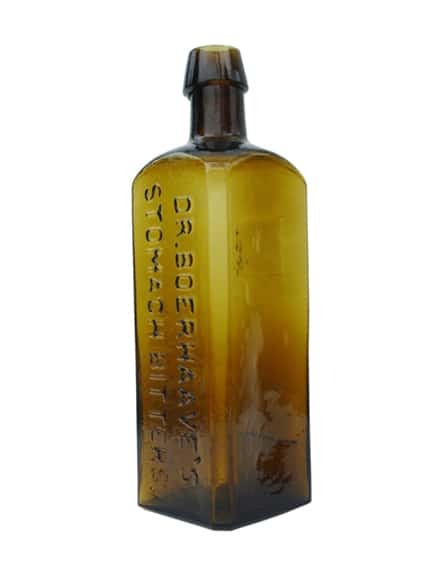 DR. BOERHAAVE’S STOMACH BITTERS, R/H B133. Square, amber, yellow-olive and green. Extremely rare. Siegfried & Philip Wertheimber & Louis Waterman, San Francisco. CALIFORNIA BITTERS R/H C12. Tapered, amber rectangle. One complete example known. Broken and re-assembled examples exist. 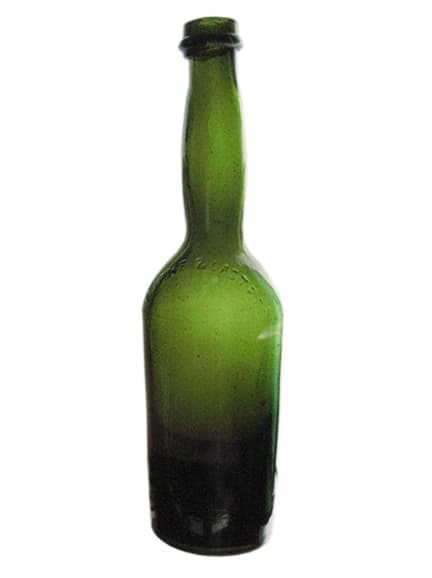 CASSIN’S GRAPE BRANDY BITTERS, F.P. Cassin, San Francisco, California. base viola shape, sensuous bottle. R/H C78 and C79. Great colors and color range possibilities. Two primary different molds. 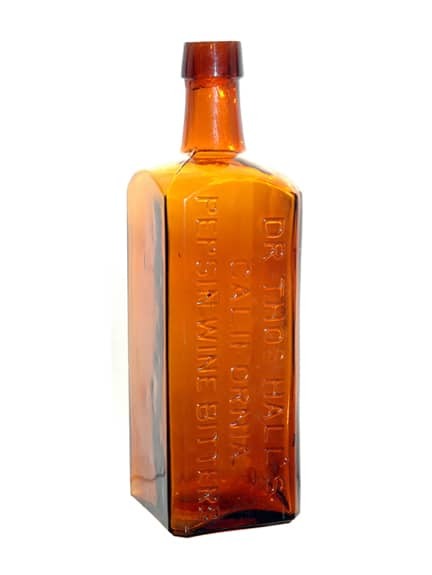 DR THOS HALL’S CALIFORNIA PEPSIN WINE BITTERS, R/H H11, Square, amber. Look for examples with applied top. 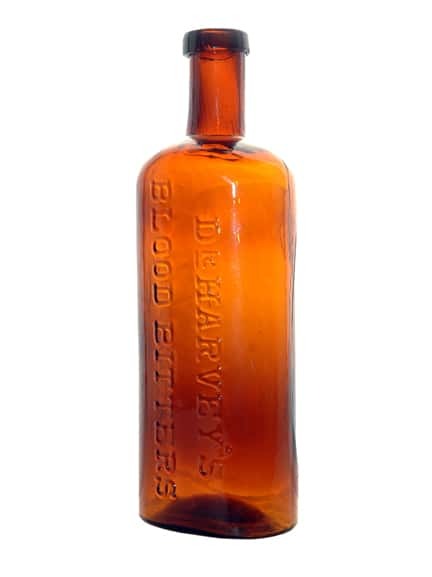 DR HARVEY’S BLOOD BITTERS. R/H H67. 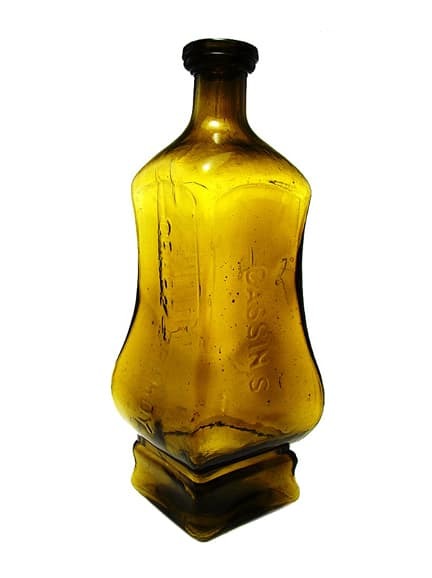 Rectangular, rounded amber bottle with sunken panels. 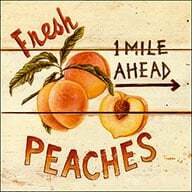 Thought from Salinas or Fresno, California. 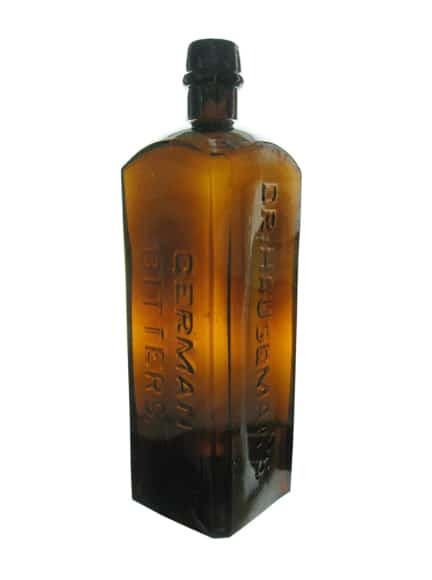 DR. HAUSEMAN’S GERMAN BITTERS, R/H H70, Extremely rare, amber square. Looking for picture of flask with the same name. 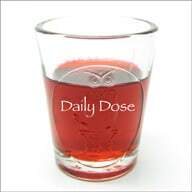 DR.HENLEY’S WILD GRAPE ROOT IXL BITTERS, R/H H85. One of a series of Dr. Henley round cylinders with various embossings. LACOUR’S BITTERS SARSAPARIPHERE, R/H L3, Three distinct variants. Round, lighthouse patterned favorite among collectors, Nice color range for runs. E.G. LYONS & CO. MANUFACTURERS SANF CO.
E.G. LYONS & CO. MANUFACTURERS SANF. 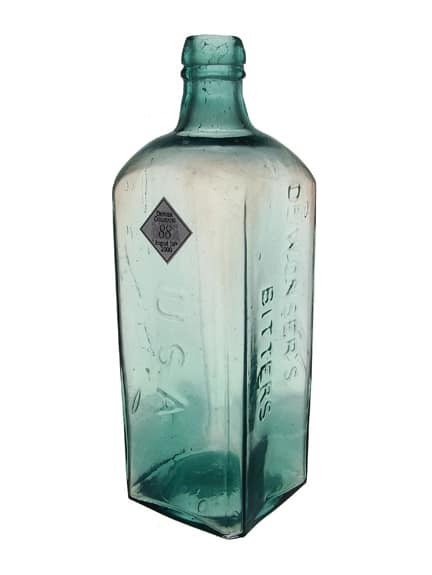 CO., not embossed BITTERS. Very rare square. Not listed in Ring & Ham. Backward ‘N’. Good color range. 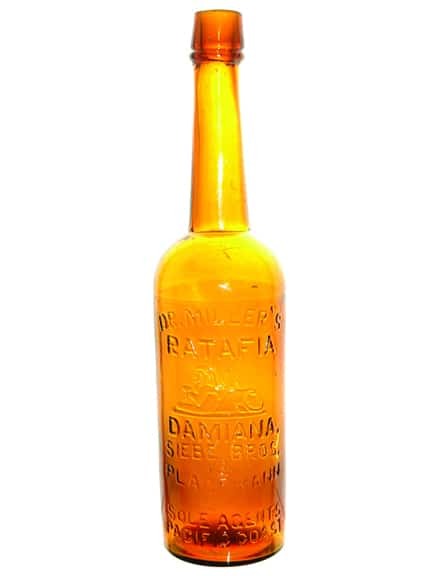 DR. MILLER’S RATAFIA (motif of pegasus) DAMIANA SIEBE BROS. & PLAGEMANN S.F. SOLE AGENTS PACIFIC COAST, R/H M90, round, amber, whiskey shape. 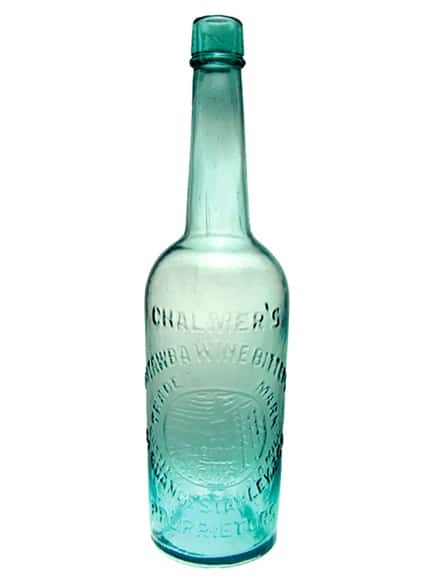 Bottle embossed with a sphinx. O.K. 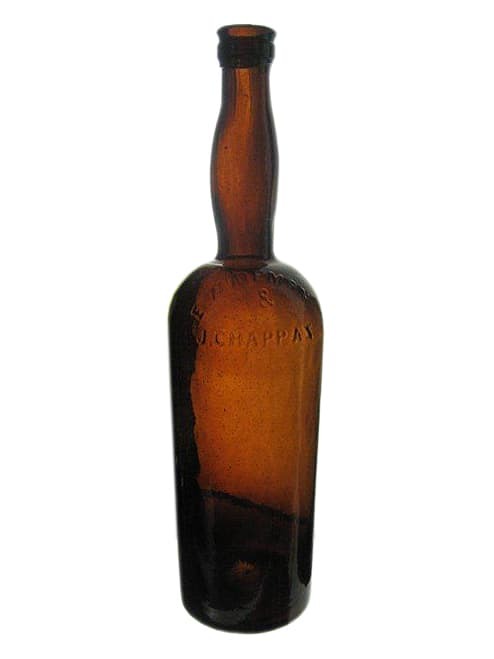 BITTERS, Extremely rare, cylindrical quart. 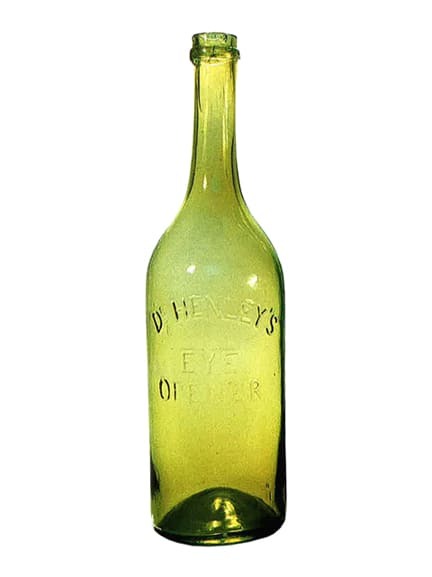 An unsuccessful product for Dr. Henley. OLD MAN’S STOMACH BITTERS / MARCUS SASS, R/H O42. Extremely rare, amber square. Possibly one complete known example. 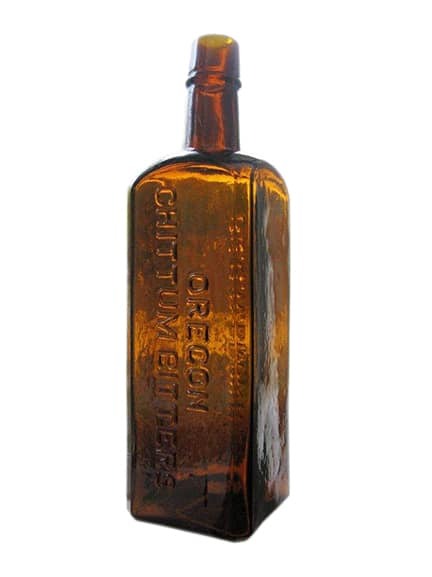 OREGON CHITTUM BITTERS | DR. G.W. BROWN’S, recent find, only know example, unlisted. Amber square. 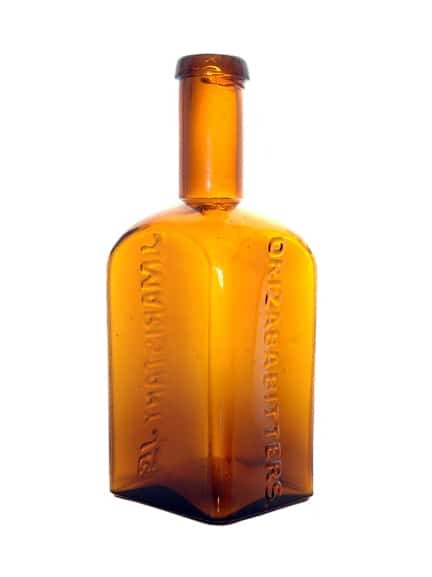 ORIZABA BITTERS | J. MARISTANY JR.
ORIZABA BITTERS | J. MARISTANY JR., R/H O88, odd shaped amber rectangular Bitters. Extremely rare. 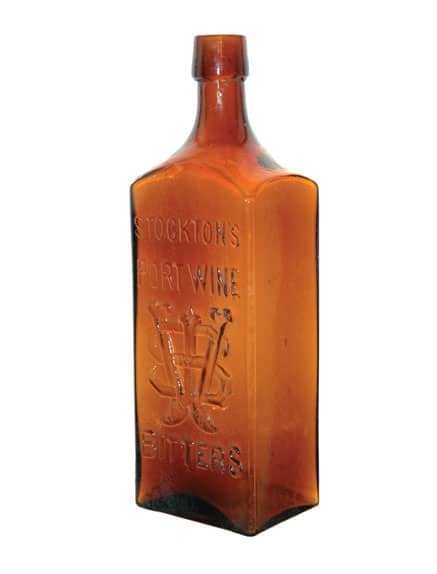 PERUVIAN BITTERS (motif monogram in shield W&K), J.C. Wilmerding and Calvin W. Kellogg, San Francisco, California. R/H P66, Amber square. Look for applied top examples. 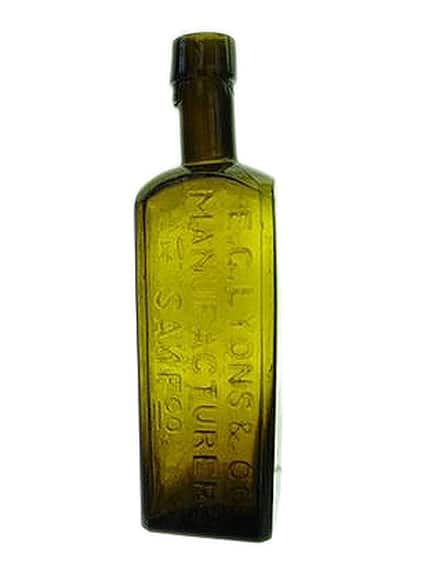 Typically in amber, there are known examples in clear, aqua and SCA. L…Dr. 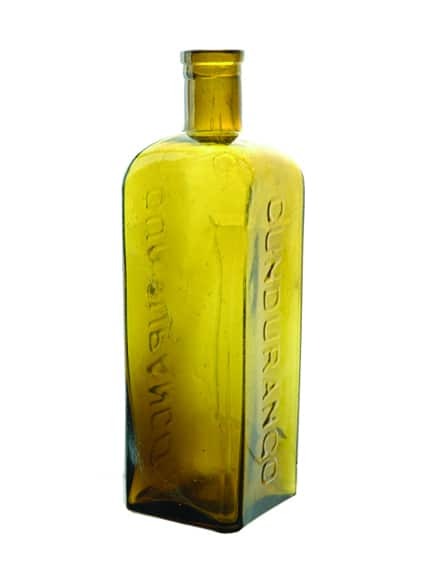 Place’s Cundurango Bitters, embossed CUNDURANGO two sides. R/H P106, Geo. 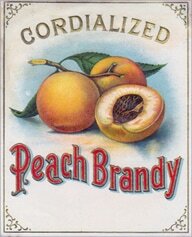 W. Chesley & Co., Sacramento, California. Square comes in interesting shades of amber, green and aqua. Possibilities for color run. 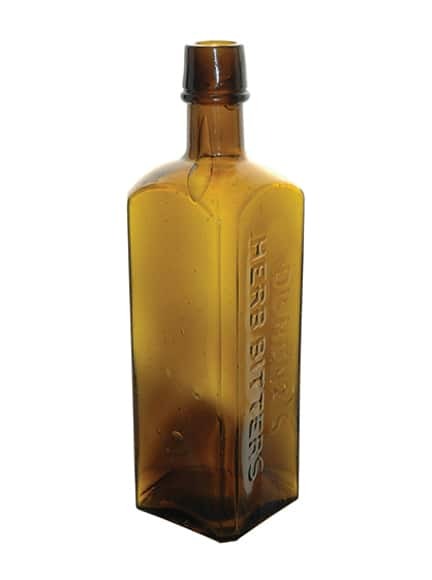 DR. RENZ’S HERB BITTERS, R/H R36-R38. Large and small letter variants. Great color range. Very popular square Bitters. 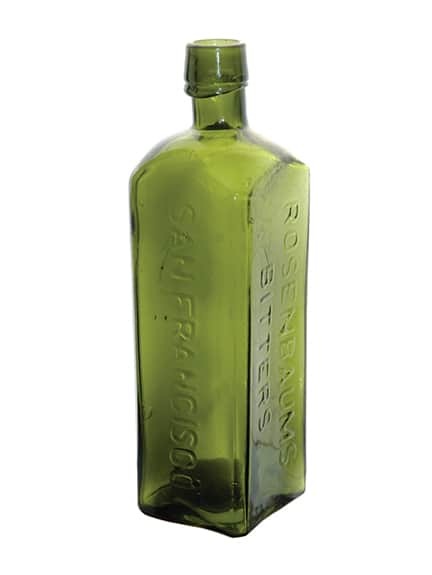 ROSENBAUM’S BITTERS, Very rare square listed as R93 and R94 (Typographic differences). Color groups possible. SALUTARIS S.F. BITTERS, Extremely rare, round lady’s leg. Green. Shoulder and base embossed. G.A SIMON’S MEDICATED AROMATIC BITTTERS, R/H S112, Extremely rare square. Amber, puce and yellowish green. Only a few undamaged specimens. 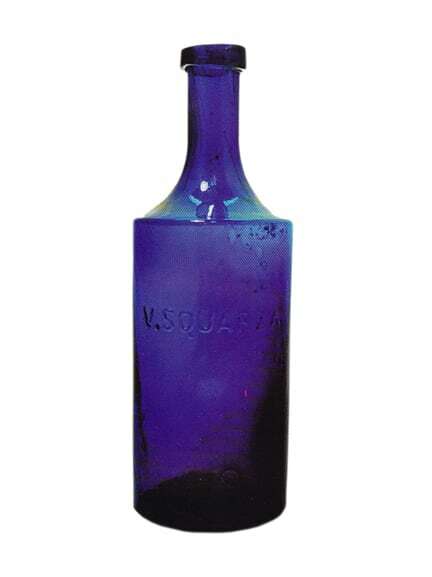 V. SQUARZA (Vincent Squarza), Presumed Bitters not listed in R/H. Cobalt blue pint, applied square collar. Labeled Bitters. No many known examples. 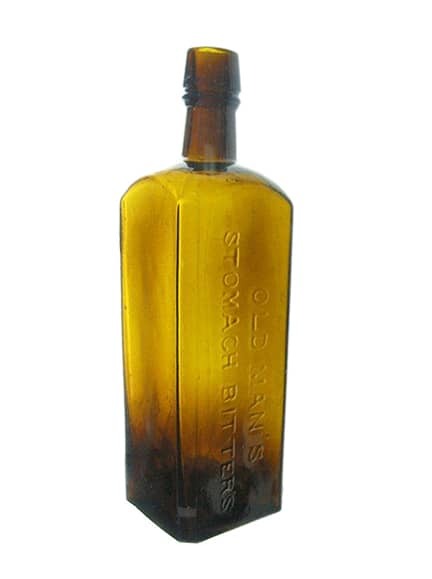 ALEX VON HUMBOLDT’S STOMACH BITTERS, Very rare square, R/H V31.Hazlett & Miller, agents for the United States. Nice color possibilities with amber, yellow, green and yellow olive. E. WIDEMAN & J. CHAPPAS, Spelled incorrectly. Assumed Bitters. Maker of ALPINE HERB BITTERS. Round cylinder. Shoulder embossed. Good colors in the less than 10 complete specimens known. 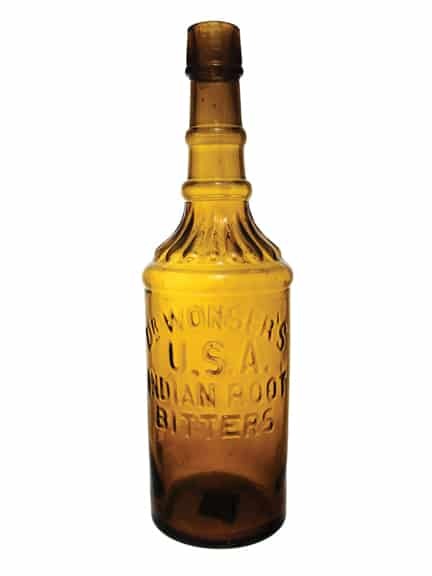 DR. WONSER’S U.S.A. INDIAN ROOT BITTERS, W146, Strong, round bottle with ornate fluting on shoulder and rings on neck. Great color possibilities. 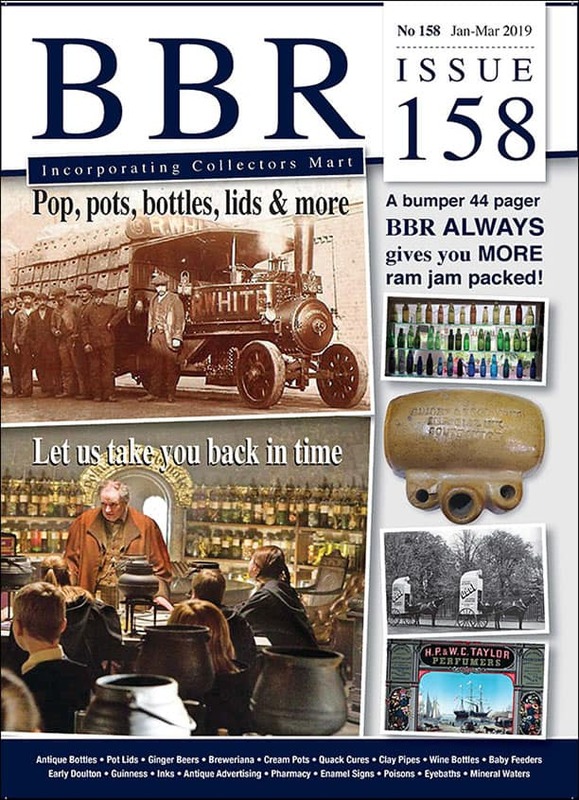 Highly popular and collectible. DR. WONSER’S BITTERS U.S.A., square, aqua version of the popular Dr. Wonser’s Bitters. Very rare, Aqua. R/H W145. 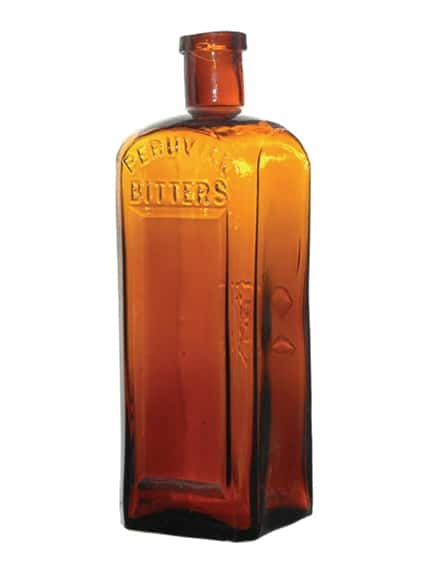 YERBA BUENA BITTERS | S.F. 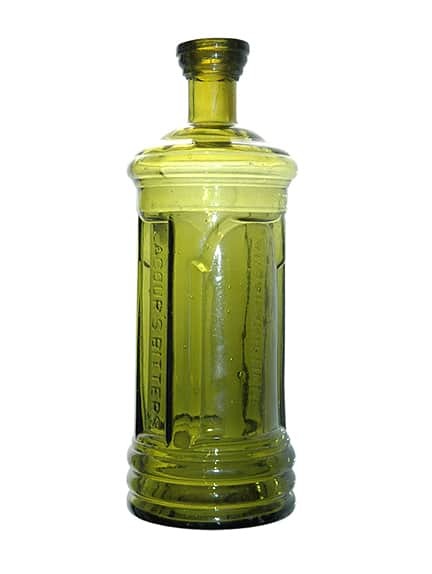 CAL, popular flask usually in amber, aqua and green. Extremely rare. R/H Y3-Y4. 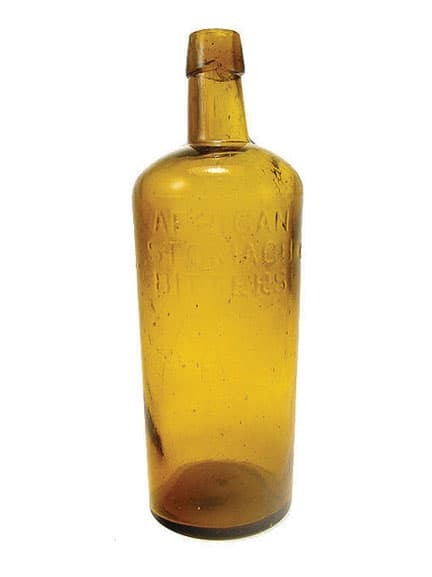 This entry was posted in Bitters, Glass Companies & Works, Questions and tagged African Stomach Bitters, Alpine Herb Bitters, Asher S. Taylor, AT&C0, bitters, Brandy, Byrne & Castree, california, California Bitters, Cassins, Catawba, Chalmers, Chappas, Chittum, Cundurango, Dale Mlasko, Dr. Boerhaave's, Dr. Henley, E.G. 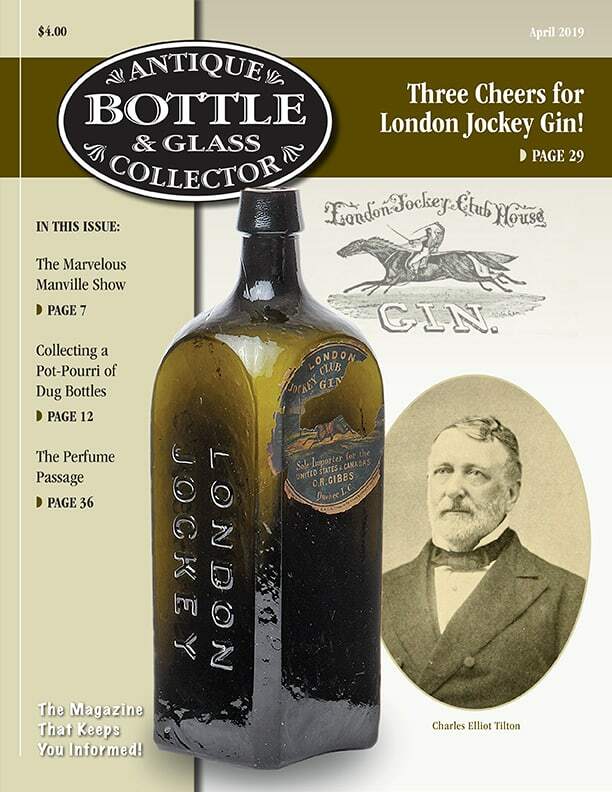 Lyon's, Eye Opener, Grand Prize Bitters, Grape, Hall's California Pepsin Wine Bitters, Marcus Sass, Maristany, Miller's, Old Man's Stomach Bitters, oregon, Orizaba, Peruvian, Ratafia, Rosenbaums, sacramento, Salutaris, San Francisco, V. Squarza, Wideman, Wine. Bookmark the permalink.